This past year has seen something of a resurgence for the Pokémon brand, as the Pokémon Company has gone all out in celebrating the 20th anniversary. After a strong start with the surprisingly good Pokkén Tournament, the release of Pokémon GO in the summer broke numerous records and drove sales for 3DS consoles and Pokémon games through the roof. With all this momentum built up, projections paint the upcoming Pokémon Sun and Moon in a very positive light. In Nintendo's Financial Briefing, the company briefly touched on the anticipated 3DS releases. Obviously, expectations are high, as Kimishima noted that the games are being positioned as Nintendo's primary Holiday games for the upcoming season. Pre-orders for the games have greatly outpaced equivalent numbers for Pokémon Omega Ruby and Alpha Sapphire, and the special demo that came out last week has hit 3.5 million downloads, setting the record for the fastest demo to reach that milestone on the 3DS eShop. What do you think? Will you be buying one or both of these games? How successful do you think they'll be? Share your thoughts in the comments below. But what about comparisons to X/Y? ORAS was a remake after all. Pokemon Sun / Moon games + Hard cover New 3DS XL + 3DS card box + Guide Book + More New 3DS XL bundle with colorful buttons + Aluminium case for game box + Official hand signature from Pokemon Sun / Moon creator + 3DS Pokemon Sun / Moon Theme + Official artworks and concepts + Z-Ring = BOOOM...!!! I preordered Moon some days ago. It'll be sharing my attention with Skytree Village. Next month will be busy. @MasterWario I seem to remember seeing a graph from one of these meetings that showed how ORAS did much better due to nostalgia or something. Looks like Pokemon Go did its job then. GameFreak seems to be trying hard with Sun and Moon to mix things up and keep the series fresh instead of playing it safe like always. So it won't be a surprise if these do well. X&Y sold 4 million the opening weekend. Its clear all the promotion for Pokemon in recent months has helped take this franchise to new levels. Perhaps Nintendo do know what they're doing with advertising? Gimma dat Sun, son! Now! These diagrams have much less value than they imply. You get the impression that the pre-order stats for Sun and Moon are twice the amount of ORAS, but since there are no numbers you can't know for sure. Not to mention that they probably used an axis with breaks. Come on Europe! Splendid show everyone! Already preordered both steelbox versions months ago and I'll even get the Solgaeo and Lunaala special 3DS edition. So yeah, definitely looking forward to them! Also, I'll probably start out with Moon. @ZeldaNX It's always better to have one axis with breaks even if you are going uphill, like these diagrams. Just in case. Plan on downloading Moon the moment it goes up on Eshop. GIMME! I'm getting Sun; so excited! Got Moon preordered as I always go for the blue/ish option. Playing most of the game as night is gonna be weird. Bit like how all my trees have gone autumnal in AC while the temperature irl ramps up every day as we head into summer. Already pre-ordered Sun back in August. I'm so hyped for these! By the way, the final starter evolutions for SM were shown by Pokémon's Japanese Twitter today. They match the leaks taken from the demo. I'm expecting it to be the best selling game in the franchise. I'm getting it with all my friends who didn't even play Omega Ruby or Alpha Sapphire. None of us preordered it either. Sales for this game should be quite impressive. I made the mistake of trying to jump in with X and Alpha Sapphire (I left pokemon after G/S) but I have my eyes on this one and I am working through the demo in hopes that this will be the game to bring me back into the fold. How can people preorder Sun and Moon before they even know what features are version exclusive? You guys should all hold out first. Also, because of this, comparing Sun and Moon to ORAS is illogical because preordering was something you could actually do without worrying about losing out on features, because they were remakes. We all knew what would be exclusive and what wouldn't be. We pre-ordered both, I wasn't sure I was gonna get it on day 1, but last time I didn't get ORAS at the same time as the hubby and was sad that I couldn't play as well, so I'm not letting that happen this time!! I agree that that comes in handy, however my point is that it is still misleading. 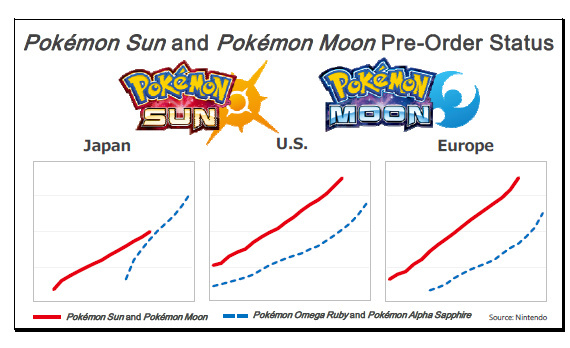 The chart implies that there are twice as much pre-orders for Sun and Moon then for ORAS, while the difference may very well be 5 to 10% (or 1% for all i know) . If there were numbers on the vertical axis you would get a more accurate view of the gap (even with the use of an axis with breaks). nevertheless i get why they present it like this. I still haven't made up my mind on which game to get. I finally booted up the demo last night, and so far it seems promising! Where is that obligatory "Gen 1 baby!" comment now? I've already preordered both games. I always have Pokemon hype - I've been nonstop hyped for this franchise since 1998. Sun and Moon are looking to be fantastic games that combine fresh takes on the classics with creative new features, appealing to fans old and new alike. I'm so happy that more people this year have given Pokemon a shot and are enjoying it! It's truly a wonderful, friendly, creative series. I hope the sales of these games reflect that.